I want to talk about my relationship with self harm. Cutting is something I’ve done since I was 14, as the years have gone by it has progressed more to burning myself with cigarettes than cutting. Self Harm was a big issue for me for many years, other than a small blip the other night, I hadn’t harmed in a few years. 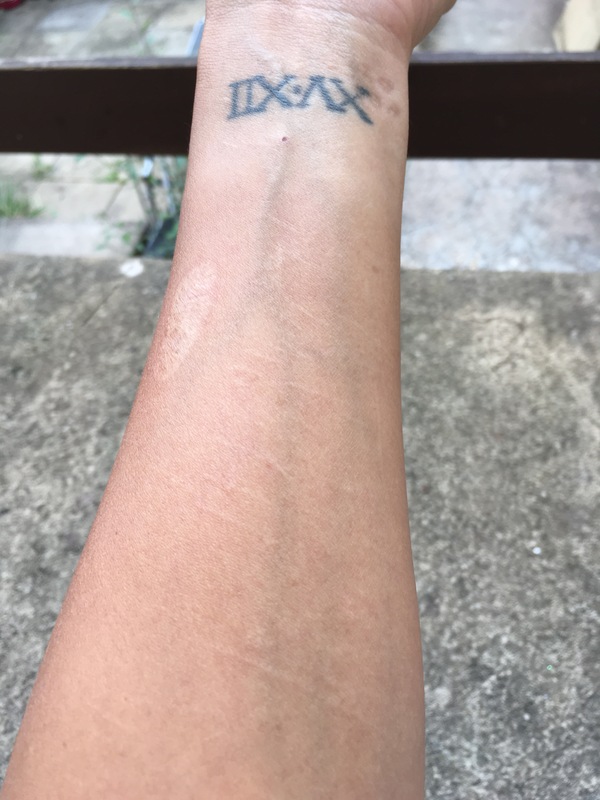 I am lucky that most of my scars are not too visible now. Apart from the large burn which has left a nasty scar, due to the size of it I tell people I burnt myself on the oven which is easily believed. I once had someone see the faint scars and think they were scars from injecting drugs! Having read information about Borderline Personality Disorder I now know that harming yourself is a very common feature. But why did I do it? I remember the very first time I self harmed, I was 14 and struggling to cope with the sexual abuse that had started. I felt powerless and out of control. I was laying in my bed feeling like I wanted to scream to the world what was happening, I felt like I could actually explode. I looked at my bedside table where I had a couple of candles burning. I held my finger over the flame, as the heat burnt into my skin, the pain intensified. For a moment I couldn’t focus on anything else, it felt like a release I’d never felt before. I remember blowing the candle out and hurrying into the kitchen to find a sharp knife. I hid under my quilt and took the knife to my wrist. It felt so good, I didn’t even feel the pain, just remember the release as I broke skin and saw blood. It became a coping mechanism for me. Whenever I felt overwhelmed or unable to cope I would cut. I’ll always remember my mum bandaging a bloody wrist one time, looking me in the eyes and saying, “think of your future, how will you explain these scars to your children”. I can’t really recall when I stopped cutting regularly. Somehow it stopped becoming a regular thing and got less often. I only really do it in extreme situations now. Occasionally when I feel suicidal and am planning my death, I realise that I would destroy my children as they would never get over it, the frustration and anger I feel that I cannot end my life will result in me self harming. It is definitely less often now but I do believe it is something that will always be with me.